Tonight's the Men's Olympics Snowboarding Halfpipe event. Have you heard of Shaun White's personal superpipe in which he compressed the training equivalent of years into a day, mastering insane new tricks that I can't even wrap my brain around? The 550-foot long half pipe is located 7 miles from Silverton, which is built around Silverton mountain: a ski resort with the most advanced terrain of any resort in America, with no groomed runs, and only one lift chair. It was constructed out of snow from the surrounding inclines, and get this: To pile up the snow—250,000 cubic yards worth—Red Bull took one of their private helicopters around and dropped about 30 satchels of explosives that weighed 25 pounds each into surrounding inclines, triggering slides that would gather up at the bottom. They hired Frank Welsh, the world's best pipe shaper, to carve out the final shape. Unlike regular resort pipes, which are comprised of man made and natural snow, this pipe's uniform material meant it didn't chunk off as others might. 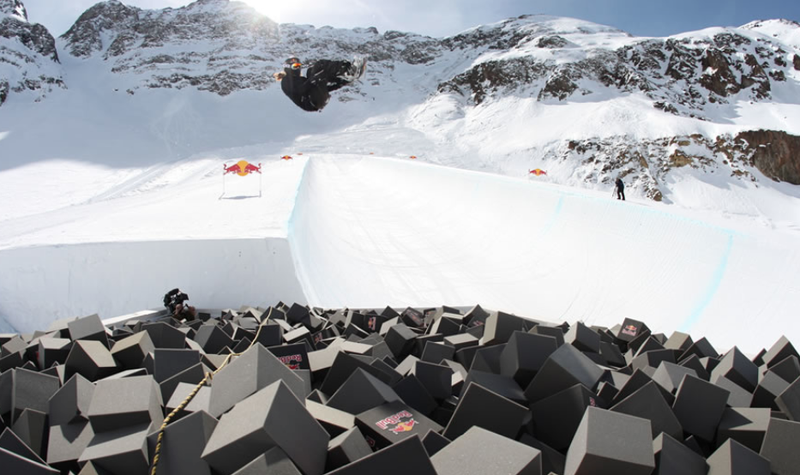 Next, Red Bull constructed a foam pit from 8,000 pounds of steel and about 7,000 foam blocks that Shaun could flip into when trying new rotational combinations like his his Double McTwist. They hauled up the thing on a truck and then when the truck couldn't get any further, snow cats. At one point the foam threw back some stored energy from his fall and he chipped the bone in his ankle, so it's not like the danger was completely gone. But a lot of it was. Enough that Shaun would learn new tricks never before performed, in a matter of hours. By his reckoning, it compressed his learning curve "by years". Shaun appears to be air lifted to the practice site by private helicopter and shuttled to the top of it by snowmobile, of which I saw a pair. I saw a clip of Shaun at the Grand Prix the other day and I thought to myself, it'll take a miracle for anyone to touch this guy at the half pipe today. Sure, luck is a factor, but If there's anything an olympic halfpipe athlete can do to to make his own luck, it's to make his own private superpipe in the secret wilds of Colorado. If you have your doubts, watch him perform his new tricks, which are on the website below. In a way, you'd think he'd want to keep his new tricks secret from his competitors. But like any competition, there's a pregame mental battle and you can bet the guys in that contest have watched those videos a couple dozen times, each time saying WTF to themselves a couple dozen times. It can't be good for morale. Unless you're Shaun White.